Radiant Heat Panels are a great way to heat the home. Find out what you will need and how much of it using out Radiant Heat Calculator and by requesting a Radiant Heat Quote. Radiant heat is growing in popularity, and is now the preferred heating system in new homes. Radiant heat provides more comfort throughout the home than standard baseboard heat. 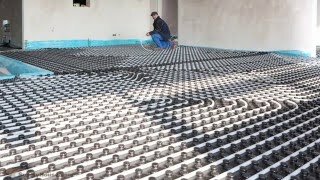 PEX tubing is installed beneath the floor and heats the home from the ground up. As the floor becomes warm, the room is heated evenly and efficiently. Radiant heat is silent, producing no creaking, banging, or humming sounds, such as those commonly heard in other heating systems. Radiant heat allows the thermostat to be set a few degrees lower than it would normally be set, while still providing the same warmth. This cuts energy bills and saves you money. Uponor (Wirsbo) Joist Trak is the best option when an existing floor is in place, but access to the joist spaces beneath them is still available. Joist Trak panels are made of a thick aluminum alloy which is great for heat transfer. These aluminum panels contain 1/2" grooves that allow 1/2" PEX tubing to be installed firmly into place. Joist Trak panels heat up as hot water passes through the PEX tubing. The aluminum panels are installed securely in joist spaces beneath the wood subfloor and transfer heat to the floor above. To determine the amount of Joist Trak and PEX Tubing needed for your project use the here. 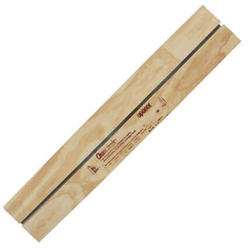 Ultra-Fin radiant panels are aluminum plates similar to Joist Trak panels. They are also installed in joist spaces beneath the wood subfloor and transfer heat to the floor above. Ultra-Fin panels are not installed directly to the joists. Instead, they are hung 2" beneath the wood subfloor which creates convection. 1/2" PEX tubing is used with Ultra-Fin panels. Uponor (Wirsbo) Quik Trak is best when a foundation is present and you can raise your floors by 1/2" but not 2". Quik Trak panels are wooden panels that contain an aluminum heat transfer plate on one side, and grooves that allow 5/16" PEX tubing to be installed firmly into place on the opposite side. Similar to a Joist Trak panel, a Quik Trak transfer plate heats up as hot water passes through the PEX tubing. These unique panels are available in straight runs or return bends to create loops. They can easily be cut or combined to fit the size and shape of any room.